Current dietary guidelines from the U.S. government and the American Heart Association (AHA) stress the importance of including lots of polyunsaturated fats (PUFA) in the diet, in place of saturated fats and trans fats. A particular recommendation in these guidelines is to rely on vegetable oil as an important source of PUFA. In particular, the AHA recommends soybean oil, corn oil, and sunflower oil as good sources of dietary PUFA. 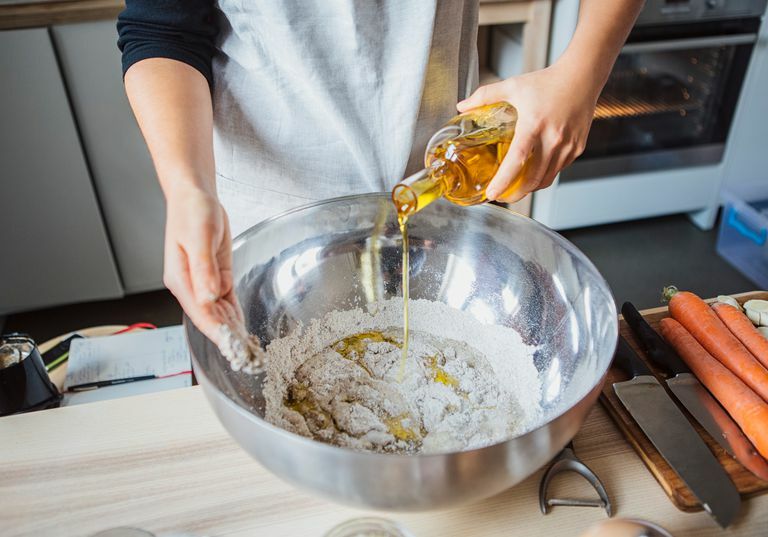 But before you invest in that large vat of corn oil, there are a few things about vegetable oil you might want to keep in mind, which the AHA appears reluctant to mention. Aside from being the most heavily industrially-processed food we eat (requiring an impressive multi-step feat of engineering, employing sundry petroleum solvents and other unattractive chemicals), vegetable oil is a recent invention. While this is not necessarily a bad thing, keep in mind that people have only been eating vegetable oil in large quantities for a few decades. So the experiment of what happens when everyone gets a substantial proportion of their calories from vegetable oil is still underway. Notably, the oil you can get just by pressing plant material (such as olive oil, avocado oil, and coconut oil) contains monounsaturated fatty acid (MUFA) and/or saturated fats — but very little PUFA. To get your daily requirement of PUFA from oil, you need the industrialized stuff. This all may turn out to be just fine for our health. I don’t know. And neither do the experts. According to the AHA, one PUFA is as good as another. But according to some very respected experts on nutrition — and to some clinical studies — omega–6 PUFA in large quantities may be a bad idea, at least when not mitigated by adding extra omega–3 PUFA. But while we wait for the experts to sort this all out, we ought to choose the vegetable oils that seem the least likely to do us serious harm. These would be: a) the oils that contain substantial amounts of omega–3 PUFA in addition to omega–6 PUFA (including canola oil and flaxseed oil), or b) the pressed oils that don’t contain many PUFA at all, such as olive oil (in which MUFA predominates) or coconut oil (which contains a type of saturated fat). An inherent hazard with PUFA is that (by virtue of their several double bonds) they are easily oxidized. In chef’s terminology, they become rancid. The rancidity is difficult to detect because, as one of the helpful steps in the industrial process that creates them, vegetable oils are treated with deodorants. The problem with oxidation is not merely that vegetable oils may become unattractive to our sensibilities. The real problem is that the oxidized oils are readily absorbed through our intestines, where — by becoming incorporated into lipoproteins and other important structures — they tend to accelerate atherosclerosis, denature DNA, and trigger inflammation. Almost everyone agrees that oxidized PUFA are a real hazard to our health. To minimize the oxidation, vegetable oils should be stored in opaque containers, in a cool, dark environment, and should not be kept for a long period of time. Oh, and cooking with them can be a problem. Oxidation is greatly accelerated with heating. Different vegetable oils have different heat tolerances, but they all tend to oxidize to some degree. (If your dinner is smoking on the stove, your cooking oil is being oxidized.) Keeping to short periods of heating, and keeping the temperature beneath the smoking point, helps to minimize the oxidation of the PUFAs in vegetable oil. But the longer you heat them, and the higher the temperature, the worse the problem. So What Should You Do About Vegetable Oil? Personally, I would simply avoid processed vegetable oils altogether. I certainly would not cook with them. For cooking at moderate heat, consider using olive oil. The MUFA in olive oil are much less subject to oxidation than PUFA (since a MUFA has only one double bond). But even with olive oil you need to keep it beneath the smoking point. For cooking at higher temperatures, I personally favor butter. Yes, it’s a saturated fat. But the thing about butter is that it’s very stable — it does not oxidize readily. And it now appears that saturated fat is not nearly as bad as the AHA and the government continue to say it is. Even if it were, I would still prefer to eat a bit of saturated fat instead of a stew of oxidized chemicals from over-heated PUFA. If I absolutely had to cook with the kind of industrialized vegetable oil favored by our national nutritional experts, I would probably default to canola oil. It in addition to omega–6 PUFA it contains MUFA and omega–3 PUFA, and has a relatively high smoke point. But I wouldn't like it. Bente LH, Blomhoff R. Determination of Lipid Oxidation in Vegetable Oils and Marine Omega–3 Supplements. Food Nutr Res. 2011;55:10.3402/fnr.v55i0.5792. Chloe E, Min DB. Mechanisms and Factories for Edible Oil Oxidation. Comp Rev Food Sci Food Safety. 2006;5:169–86. Kamer J. Dietary Advanced Lipid Oxidation End Products Are Risk Factors to Human Health. Mol. Nutr Food Res 2007; 51:1094–101. Nawaz WW. Chemical Changes in Lipids Produced by Thermal-Processing. J Chem Educ 1984;61:299–302.